To achieve happiness, there are so many things we need to check and balance. Overtime, I have discovered that keeping grudges slowly kills the mind and body. Religiously, our leaders never stop preaching about forgiveness, something we find difficult to or assume we can’t comprehend and put to practice… After all we are only human. I’ve often mistaken the act of forgiving as a weakness our counterparts would forever throw to our faces. But the truth is, once you forgive, you acquire an inner peace. There’s absolutely nothing hard in learning how to forgive. A forgiving heart is always lightweight. Pride is a destructive force that ruins those it comes in contact with professionally and personally. When you set pride ahead of humility, you refuse to see your mistakes or accept them, thus preventing the chance of learning from them. Never be too sure of yourself… Never count your eggs before they are hatched. Be yourself, stay positive and wait for an outcome then hit the celebration button. A crazy entity that kills its victim within… It comes from self judgement and the judgement of others… You are too worried about what others think of you. Trying to live for others only make you live fallaciously. You are not who you claim to be. Fight it! Jealousy, an offspring of insecurity, does more harm than good to you because all that matters is what you might lose at one point in time… Relationships borne out of jealously are often hazardous because it can makes one murderous consciously or not. A silent killer, keeps haunting you, leaving no space for happiness. The thought of one’s past life, activities or experiences seems inevitable. Letting go of the past might look like a hard nut to crack but the minute you stop getting ruled by thoughts of the past, the greater, happier, healthier and grateful you will be. To let go of the past, realise that you cannot change the past or get back the time you’ve lost, but you can make the future and avoid losing more time. Mistakes prove to be inevitable, most times no matter how we try, mistakes still find a way to plunge itself in… Rather than being afraid of a mistake, why not try and be grateful you actually did? A situation most teen and young adults fail to deal with. When you spend you so much time with someone of negative influence to you, you tend to behave like them or worse to your detriment. Stay away from people who add no values to your life. People who do not encourage you or help see the brighter part of life but are filled with negativity. Mingle with the right kind of people. Everyone deserves the right to be happy… Why should you be scared of never finding happiness? No one holds the key to your happiness but you, you alone decide to place your happiness on someone or something else. Depending on some else for happiness might just be you ending up hoping for what will never be realized. Remember, to love, you need to love yourself first! Lastly, never hate yourself. I know some circumstances beyond you may prompt that sudden self hate but always make you the love of your life and aim to be greater and better than who you presently are rather than chastising yourself. 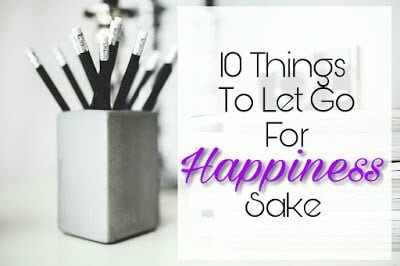 I need to let go of 4, 6, 7 & 10. So help me God.